Can a Spouse Ask for Financial Assistance From Her Spouse During a Divorce? 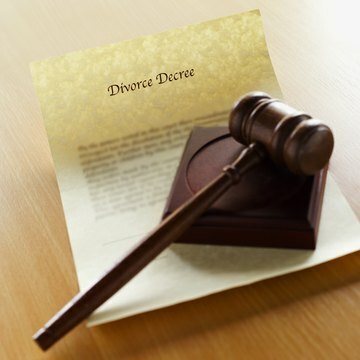 Divorces can last months and sometimes years. Many people in the midst of divorce find the financial burden overwhelming and need financial assistance from their spouse before the divorce is final. In most states, once your divorce action has started, you can ask the judge to order your spouse to provide you with financial assistance on a temporary basis until the divorce is final. The availability of temporary orders and the process for asking for them varies among states. Consult your state laws and local court rules before attempting to request a temporary order. A joint stipulation is an agreement you reach with your spouse concerning any matter related to your marriage, children or impending divorce. If your spouse agrees to provide some financial assistance during the course of the divorce, you can put the agreement in writing and ask the judge to approve it, entering a temporary order requiring you both to follow the agreement. Although you can reach an informal agreement without the court’s involvement, a joint stipulation endorsed by the court is more enforceable against your spouse. If you and your spouse have children and you have primary custody of them, you can ask the court to order your spouse to pay temporary child support. Temporary child support orders are usually accompanied by temporary custody and visitation orders, which formalize the custody and visitation arrangement. If custody and child support is contested, you can request that the court make a determination about who should have custody of the children and who should pay child support. Your specific custody arrangement and your and your spouse’s income will determine the amount of temporary child support owed. You may be entitled to some child support even if you and your spouse share joint custody of your children. Spousal support, also called alimony, is available in most states under a variety of circumstances. Generally, if one spouse earns less money than the other spouse because of career, family or lifestyle choices made by the couple, the spouse making more money can be ordered to pay spousal support. Spousal support laws vary widely among states. Consult your state’s laws to determine whether you may request temporary spousal support. A significant portion of the financial burden of your divorce will be the cost of your attorney. Under the right circumstances, some states allow you to request that your spouse temporarily pay part or all of your attorney's fees. In most states, you can ask for just about any temporary order reasonably related to the marriage or divorce. For example, you can ask the court to order your spouse to continue paying all or part of your rent or mortgage, even if your spouse does not live in the house. You can also ask the court to order your spouse to continue paying your health, life or automobile insurance until the divorce is final. Many states will enter temporary orders covering a wide range of financial and personal issues, as long as you can make a well reasoned and compelling argument for why the temporary order should be issued. Divorce sometimes comes out of the blue. It’s not always the kind of event you can save up for, and the process can be quite pricey. The costs of a highly contested divorce can easily amount to what you might spend on an automobile or a down payment on a home. This can be especially unfair when one spouse has significant financial resources, and the other spouse has none. Some state laws anticipate this and have safeguards against it. If your state doesn’t, you might have to get creative about raising cash. By their nature, emergencies tend to appear when we least expect them. Divorce cases are not immune to unexpected life events. If you are a party in a divorce and find yourself facing a crisis, it might be possible to obtain immediate assistance by filing an emergency motion with the court. The name and procedural rules for this type of motion vary by state, so it is important to check your state's requirements before you file.